A funny, tough-minded case for being and having an only child, debunking the myths about only children and taking glory in the pleasures of singletons: “A swift and absorbing read…may change your mind and the national conversation” (Psychology Today). Journalist Lauren Sandler is an only child and the mother of one. After investigating what only children are really like and whether stopping at one child is an answer to reconciling motherhood and modernity, she learned a lot about herself—and a lot about our culture’s assumptions. In this heartfelt work, Sandler legitimizes a discussion about the larger societal costs of having more than one, which Jessica Grose in her review in The New Republic calls, “the vital part of the conversation that’s not being discussed in the chatter” surrounding parenting. Between the recession, the stresses of modern life, and the ecological dangers ahead, there are increasing pressures on parents to think seriously about singletons. Sandler considers the unique ways that singletons thrive, and why so many of their families are happier. 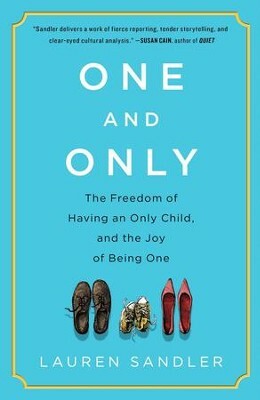 One and Only examines these ideas, including what the rise of the single-child family means for our economies, our environment, and our freedom, leaving the reader “informed and sympathetic,” writes Nora Krug in the Washington Post. Through this journey, “Sandler delves deeply, thoughtfully, and often humorously into history, culture, politics, religion, race, economics, and of course, scientific research” writes Lori Gottlieb, The New York Times Book Review. “I couldn’t put it down,” says Randi Hutter Epstein in the Huffington Post. Sandler “isn’t proselytizing, she’s just stating it like it is. Seductively honest.” At the end, Sandler has quite possibly cracked the code of happiness, demonstrating that having just one may be the way to resolve our countless struggles with adulthood in the modern age. Lauren Sandler has written on cultural politics, religion, and inequality for Time, The Atlantic, Slate, and The New York Times. She lives in Brooklyn, New York. I'm the author/artist and I want to review One and Only: Why Being an Only Child, and Having one, Is Even Better Than You Think - eBook.